Local underdog Pino Priolo broke through for his maiden Pro Slammer win. pic: Phil Luyer, High Octane Photos. MEDIA RELEASE: Local underdog Pino Priolo finally broke through for his maiden 400 Thunder Pro Slammer victory at last night’s rescheduled Home Group WA Nitro Slam eliminations at the Perth Motorplex. 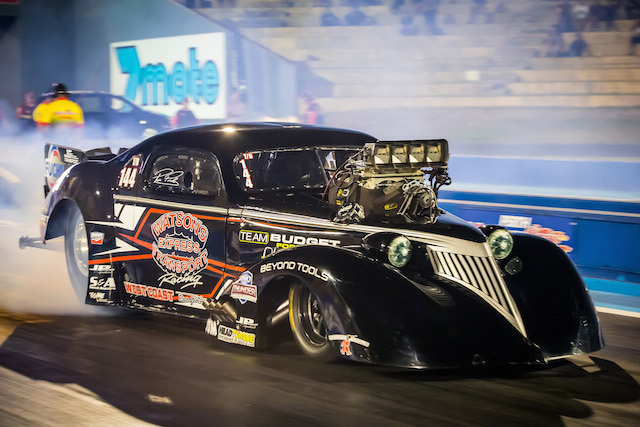 Priolo beat Sydney’s Mark Belleri with a 6.023-second/385.72km/h run from the Watson’s Express Transport ’37 Chevy Pro Slammer to his rival’s 6.078 in the Holden Trade Club Monaro. In the rescheduled Top Bike eliminations, Perth’s Mark Drew continued his reign on his nitro-fuelled Harley Davison V-Twin by defeating the turbocharged Kawasaki of Greg Durack in the Nitro Slam final. “I’ve been runner-up twice before, so [tonight] was third time lucky!” Priolo said. “I had a really good feeling today on my way to the track, and I knew I just had to race hard. Priolo said he’d celebrate his win with a morning surf before returning to the Motorplex to attempt to claim back-to-back titles. “We’re sitting pretty for [Saturday night’s] Westernationals now. Zappia and Belleri will be hard, but I’m determined to beat them again,” he said. The Nitro Slam eliminations were rescheduled due to unseasonal summer rain ending the event early last December, and were held as part of qualifying for tonight’s 45th Annual Home Group WA Westernationals. In a sensational night of qualifying, Brisbane’s Gary Phillips took top honours for the Westernationals’ Pro Alcohol bracket, while local hero John Zappia returned to form to take the number one position in Pro Slammer with a stunning 5.71-second performance. Phillips stole the top qualifying position from local quick Craig Glassby, a world-class 5.420-sec/429km/h pass in the Lucas Oil Products Chevrolet Monte Carlo Funny Car bumping Glassby’s close 5.448 run to second, with points leader John Cannuli just another hundredth of a second behind in third (5.454-secs). Shannon Taylor sits on the bump spot in eighth (6.930-secs), and will face Phillips in tonight’s first round. Zappia will face eighth qualifier Paul Cannuli (6.217-secs) in tonight’s first round of Pro Slammer eliminations. Eliminations for the Home Group WA Westernationals take place today, with the 400 Thunder Sportsman series underway from 2pm AWST, and Pro Alcohol and Pro Slammer from 6pm.